Blogs from the bank: Carp and Coarse fishing: And now for something completely different! I have been fortunate this last week to have taken a holiday in Nashville, Tennessee which featured a bit of a road trip to Memphis - something of a musical pilgrimage you might say but I couldn't go all that way without packing a travel rod and a few jelly lures. Nashville is situated below the many meanders of the Cumberland River so I expected that might provide me with the odd opportunity to wet a line. The river, as it flows through the city however, is quite inaccessible to anglers due to urban developments and scarily steep banks so I had to seek an alternative location for my taste of fishing in the states. Percy Priest Lake seemed to be the perfect location but as it was a little bit out of town and we had a busy schedule my only window of opportunity fell upon the final few hours before check-in at the airport. To fish in Tennessee a TWRA (Tennessee Wildlife Resources Agency) license is required but it seems most public parks and waterways are free to fish without day tickets or club memberships. I found out the hard way in advance of my trip that it is impossible for a non U.S. resident to purchase a license online but the TWRA Facebook page were very helpful in pointing me in the right direction and once in town I was able to buy a 3 day permit for $16.50 with relative ease at the Bass Pro shop, which by the way, is the biggest tackle shop I expect I will ever see in my life! The TWRA provide a PDF fishing guide which got my hopes up to catch some Bass or Sunfish perhaps or maybe even Gar - all of these hopes were reinforced by the very helpful guy in the tackle shop. The reservoir itself is massive! 14,000 acres of man made lake fed by the Stones River. This flooded valley takes its name from the engineer who built the dam, J Percy Priest, for the purpose of hydro-electric power. This is by far the biggest lake I have ever fished and yet I had such little time! I had been directed to a couple of spots either side of the dam wall - the first of which was shallow and rocky with a sudden drop-off. I lost several jigs trying to fish over the shelf - an approach which would have been far better attempted from a boat casting towards the bank but that wasn't on the cards unfortunately. Over the other side it dropped off much quicker and I could see small fry and amongst them, slightly larger fish milling around. They did not seem interested in anything I offered, even though I tried a variety of bottom-bumping techniques. I noticed a few fish in the margins spooking as they saw me walking the bank so I sought out a spot 'off the beaten track' where they might take cover in snags which I could cast to without giving myself away. Even this resulted in nothing but frustration as my one and only chance to catch here was slipping through my fingers. 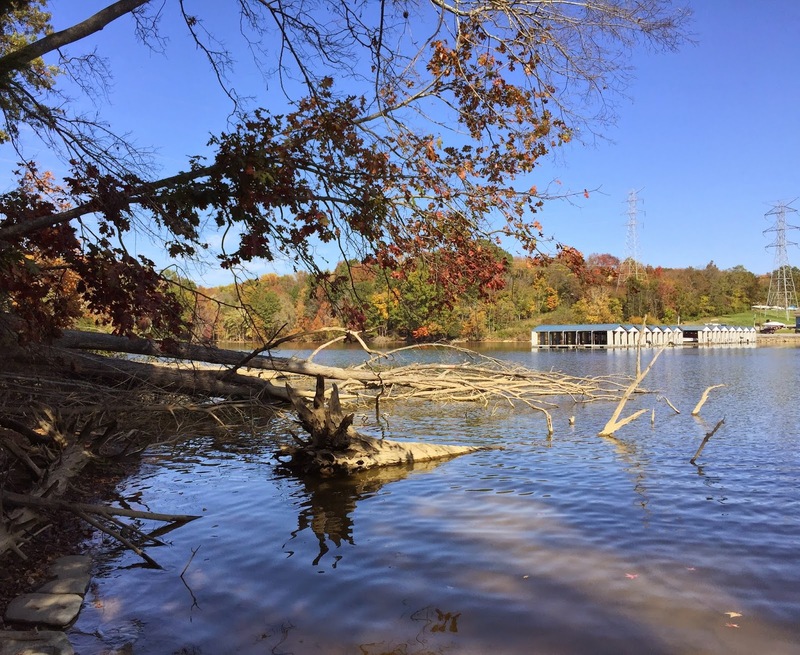 I spoke to some other anglers who acknowledged that the fishing here had been slow recently and so I decided to drive down beneath the dam and fish the Stones River as it reemerged to resume its course into the Cumberland. A few other anglers were already there which gave me a bit of confidence as did the sight of many fish leaping out of the water. One told me that this isn't really the time of year to catch bass and pointed out small minnows (roach) in the margins being chased by slightly bigger silver fish - these, he said, were skipjacks or skipjack herrings also known as the 'Tennessee Tarpon'. They were feeding up before starting their migration to the sea. I had previously been most persistent with a little silver shad which resembled the bait fish but noticed this local angler was using a bright yellow jelly, so with such little time left, I saw no point in being proud and copied his tactic. This produced me a fish on the second cast! Now these fish are certainly not river monsters, averaging only about 12" but they fight like fury and made great sport on my 10-30g casting weight telescopic travel spinning rod! This battle is enhanced immeasurably by this fish's tendency to leap right out the water whilst you are trying to bring it in. These acrobatics cost me 2 fish before another kind angler came over as I was playing one and told me to tighten the clutch and reel it in quickly because otherwise the fish will be able free itself by creating slack in the line whilst doing air time. I took this advice and managed 2 more fish before having to leave for my flight home. I might not have caught anything huge, nor were they the bass I was hoping for but it was tremendous fun catching fish that punch well above their weight in such an epic setting. Nashville is known as 'Music City' with a bit of a reputation for being a party town and it lived up to this and totally exceeded my expectations but I am so glad that my passion for angling lead me to experience a very contrasting, beautiful and peaceful side of this vibrant musical Mecca.